More elaborate systems that require products to be delivered to different locations throughout the warehouse, will need some sort of sortation solution. Choosing the right sorter is a factor of many things: the physical attributes of the conveyed items, throughput rates, and space limitations to name a few. There are several classes of Automotion sortation conveyor that satisfy many different system requirements. From the cost-effective trap arm to the space efficient pop-up sorter, to the high speed, high volume shoe sorters, Automotion has the right sorter for you. Unsure which sorter is best for your application, Automotion's customer service representatives are standing by to help you make the right choice. Single side sort rate up to 200+ CPM, Double side sort rate up to 130 CPM. Speed up to 600 FPM. Pneumatic & Magnetic divert switch. Infinite adjustable positioning of divert gates. Energy absorbing elastomer cushions on all divert shoes. 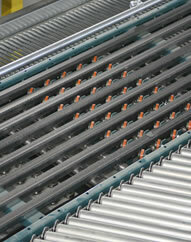 Integral belt conveyor infeed unit provides consistently smooth transition of product. The divert section on the AutoSort 16, is a 30° Pop-Up Wheel divert. This divert uses (5) rows of pop-up wheels, that pneumatically lift the product off the belts and onto an awaiting take away. This action is powered by the main conveyor, so no additional drives are necessary. If a perpendicular divert is needed, the AutoSort 17 features a divert section composed of pop-up rollers. Ideal for shipping and/or receiving operations with a high rate, high volume requirement. Can accomplish rates up to 100 cartons per minute* at speeds up to 400 ft. per minute. Transports product on a surface of multiple belts. Each belt is properly tensioned by an individual spring take-up. The belt tracks feature a unique "rolling design", that results in a longer belt life, quieter operation, and a reduction in necessary horsepower. The AutoSort 16 uses a divert point that consists of a series of pop-up wheels that are angled at 30°. These wheels are driven by the main conveyor and require no additional drives. The AutoSort 17 uses a divert point that consists of pop-up rollers that are angled at 90 °. The multi-belt sorter is a modular system that is composed of a drive section, intermediate bed(s), divert bed(s), and a tail section. Ideal for shipping and/or receiving operations with a high rate requirement. Handles a wide variety of conveyables up 75 lbs., depending on system sort rate and design. 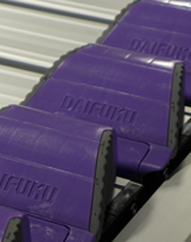 Gentle controlled sweeping action diverts conveyables at a 45° angle onto powered or non-powered takeaway conveyor. 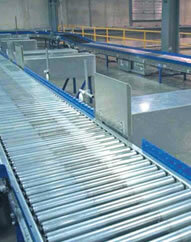 Designed to be used with Automotion's standard belt conveyor or live roller divert conveyor. Best results accomplished when paired with an Automotion high speed induction conveyor. Ideal for shipping and/or receiving operations with a medium rate requirement and where product orientation needs to be preserved. Handles a wide variety of conveyables up 75 lbs., depending on sys. sort rate and design. Diverts 45° onto powered or non-powered takeaway. Product maintains orientation. Automotion's trap arm sorter provides flexibility and effectiveness in handling and separating a wide range of packaged goods and materials. 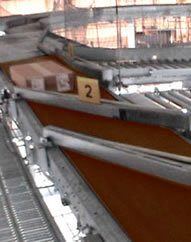 The trap arm, which is air operated, diverts product from the sort conveyor an onto a powered or non-powered take-away conveyor. 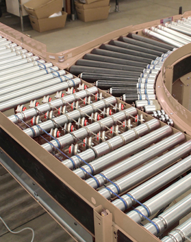 The trap arm sorter is ideal for medium rate sortation applications. 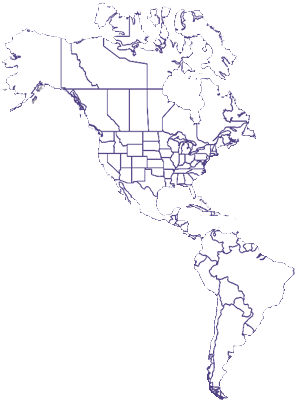 Ideal for shipping and/or receiving operations with a medium rate requirement. 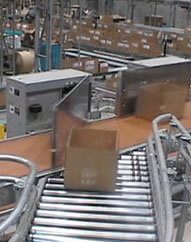 Diverts at an angle of 90° onto a powered or non-powered takeaway conveyor. Automotion's AutoSort 02 is a pusher sorter, that diverts product from the sortation conveyor onto a take-away conveyor by extending the diverter when the product passes in front of it. It can transfer to a conveyor that is parallel or perpendicular, which makes it a good option when linear space is limited. The pusher sorter is ideal for medium rate sortation applications. Ideal for shipping and/or receiving operations with a medium rate requirement and where linear space is limited. 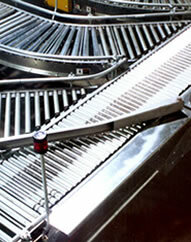 Diverts 90° onto a parallel or perpendicular, powered or non-powered takeaway conveyor.